Actors have learned how to communicate with genuine emotion every time they’re on stage or in front of the camera. Find out how to create maximum impact with any presentation with Presenting You. 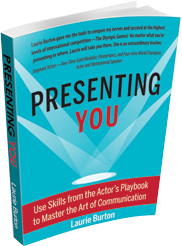 Laurie Burton brings over 30 years of experience as an actor, adjunct professor at USC and corporate trainer for companies such as 20th Century Fox, Mattel and IBM to the pages of her new book. Presenting You will teach you how to bring forth your own passion, energy and animation and deliver the ultimate performance—every time. Get started! Download a free chapter or buy the book today. Laurie Burton gave me the tools to conquer my nerves and succeed at the highest levels of international competition—The Olympic Games! No matter what you’re presenting or where, Laurie will take you there. She is an extraordinary teacher.